Putting Steampunk Outfits Together–Part II | STEAMED! Congrats, please email me at suzannelazear (@) hotmail to claim your prize. Next off, I’m going to continue to my series on how I created some of my Steampunk outfits. Even if you’re not the crafty sort (like me) you don’t necessarily need to go out and buy an expensive ready-made Steampunk outfit (as pretty as they are). You may already own some of what you need. Today’s outfit is something I pieced together mainly out of things I already owned. I love costumes and have a trunk full of stuff. I had no idea I even already had most of the stuff I needed to create a cute outfit until I wanted to put together a mostly black outfit. 1. The skirt is just a big, black lacy skirt I’d picked up somewhere at some point. It’s one of those skirts that can be everything from Gothic to pirate to gypsy. It’s full enough that I can wear it over a hoop and very comfortable. 2. The black lace blouse is actually from Forever 21, of all places, as are the gloves. I bought them last summer when they had a ton of victorian-ish stuff. They often have great jewelry and you can’t beat the prices. 3. What ties this all together is the black corset belt. This one is from Clockwork Couture but I nearly used a black waist cincher that I usually used for the Renaissance Faire. See, just a few easy pieces that you may already have — blouse, skirt, waist cincher/corset can be thrown together to create a basic outfit. Then you can accessorize it depending on your style and what you already have. 4. Because I’m obsessed with hats, I already owned the perfect hat. I got this one from Ms. Purdy. I actually have a few of her things and I really like them. 5. The necklace was a gift from a friend, but I love it and wear it with most of my Steampunk outfits. 6. Finally, I added a tie-on bustle, which is exactly what it sounds — a big, ruched piece of fabric designed to look like a bustle you simply tie on top of your skirt. There are a ton of types of these from punk mini ones made of net to elaborate and elegant ones. I got this one on Etsy from Loriann. Tie-on bustles are inexpensive ways of changing up your outfit and they’re a lot more comfortable to sit in. This wasn’t something I had on hand, but that I bought to complete the outfit. View of tie-on bustle. Picture by Loriann. See, easy. Take stock of what you already have and don’t be afraid to repurpose. That blouse from Renn Faire, skirt from your belly dancing days, or hat you bought for your cousin’s wedding may have other uses–especially if you’re willing to replace buttons, add gromets, or add a little flair to it/ Make a list of what you still need to complete your outfit and case thrift shops, the internet (I’ve found a lot of good costume pieces on ebay and Etsy), or perhaps even try to make it. If you’re gearing up for something, I’ve found that it’s easier on the pocket-book (and less daunting) to plan ahead and buy one piece per paycheck until I have everything I need. Now, I just need some gadgets…has anyone seen my raygun? This is so creative. I have a bunch of material and stuff and I cant come up with anything. 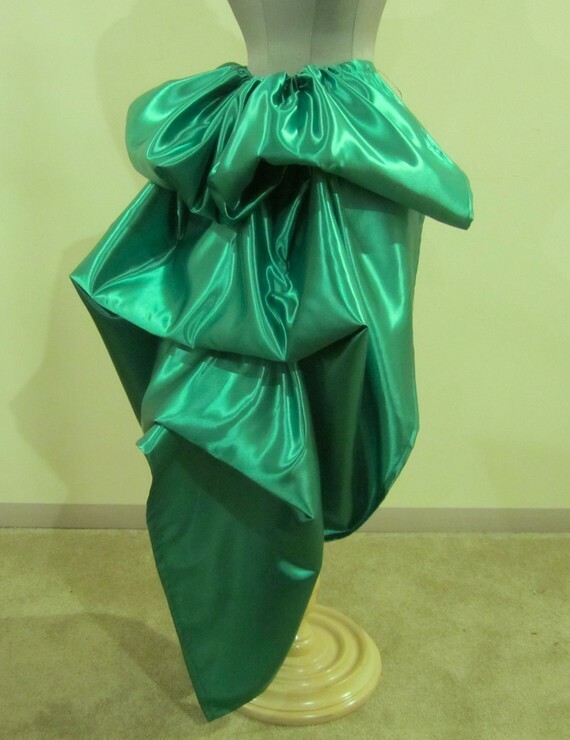 I really like the green material ruffled.